It’s the perfect castle in the perfect setting built during the wrong time. Perched high in the German Alps, Neuschwanstein Castle is the epitome of the fairy tale palace with its beautiful white limestone facades and numerous turrets and spires, but given that it was built several hundred years after medieval times, the large windows carved out of every wall help attest to the fact that it was built as a home, not a fortress. Neuschwanstein Castle towers over the Bavarian village of ohenschwangau, just a short bus ride from the nearest train station in Fussen. The surrounding mountains are dotted with evergreen trees and numerous lakes; one of which was where the dead body of King Ludwig II (or the swan-King) was found floating shortly after he went mad, and many years after he ordered the castle to be built in the late 1860s as an homage to the bygone era of knights and mythology. I watched the shadows of clouds float lazily over a landscape dotted with villages that, aside from the modern roads, have probably looked the same for centuries. The lakes were a rich blue, and all the vegetation was a lush green. When I rounded the last corner and got my first glimpse of the castle up close I couldn’t help but stop and stare. The castle rises precariously out of its rocky foundation and seems to flirt with the sky. An amazing sight that leaves little wonder as to why it served as an inspiration for Disney. I walked around the base of the palace and climbed to its upper courtyard where I took in the same scenery I had seen on the hike up. The Marienbrucke bridge, which spans a small stream and waterfall next to the castle, was crowded with tourists and I realized I was probably making it into a few hundred photographs. I joined up with one of the tours and we began by entering one of the king’s servants room which, not to be outdone by the other rooms, was covered in oak-paneled walls and contained beautifully carved furniture. We continued on to the next rooms and it seemed that every inch of the interior dripped with the kind of elegance that I thought only existed in Versailles. Everywhere I looked I marveled at the numerous paintings of medieval legends and heroes. 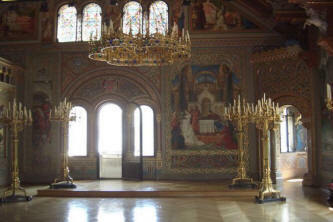 The throne room — though missing the throne — was particularly breathtaking; its platform was flanked by tall candelabras and capped off by a dome on which was a painting of Christ and His canonized kings. As we walked, our guide related some of the history of Ludwig and the Castle’s connection with Richard Wagner. 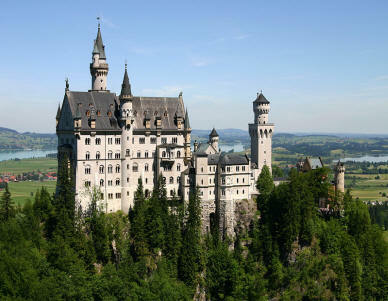 Wagner was a close friend of the king and it was he who Ludwig first wrote to with his concept for Neuschwanstein, and it was Wagner’s mythical operas that served as the inspiration for the design and construction of the fantastical structure. After the tour was over I found myself back in the courtyard and I gazed over a parapet down to Hohenschwangau Castle. For a combined admission ticket of 17 euros both castles can be toured, but after seeing Neuschwanstein it’s more than obvious which outdoes the other. Aching to see the castle from another angle, I took the short hike over to the Marienbrucke bridge whose vantage point is the best for taking pictures. I don’t have a huge fear of heights, but the thought of walking out onto a bridge built more than a hundred years earlier and paved with wood planks made me hesitate. Reluctantly, I stepped onto the planks and rolled my eyes as they flexed under the weight of my body and the scores of others along its span. I stared down at the waterfall far below us and I slowly let my eyes rise to see the castle again. It simply awed me. To me, it will always be one of the most beautiful sights in the world. Open all days except Christmas Eve, Christmas Day, New Year’s Eve, New Year’s Day and Shrove Tuesday. Opening hours vary by the season. 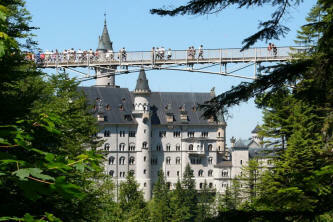 Admission – €9 for just Neuschwanstein, or €17 for both castles, booked in advance. Buying the tickets on the day of a tour will be a Euro or two cheaper, but it is recommended to book in advance.